Throughput, scalability, and transferability—when it comes to method development for protein and peptide sample prep, these factors can challenge the success of even the most skilled practitioners. An intuitive and reliable automation platform, working in concert with a suite of designed-for-purpose software tools, can be the key to breaking free of the limitations of entrenched manual methods. Ideally, an automated method development platform should feature the functionality of typical wet-bench chemistry, with all the benefits of automation. Recent technological advances have brought new levels of reproducibility, reliability, and usability into scientists' hands, offering the potential to transform their ability to carry out quantitative proteomics with unprecedented analytical precision. 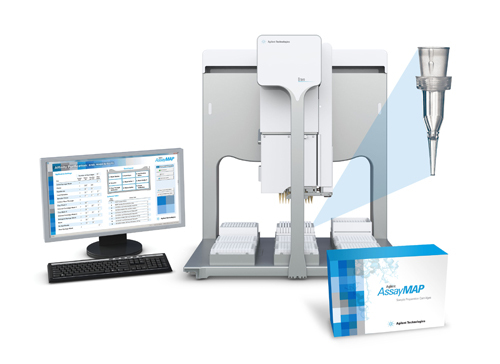 The Agilent AssayMAP Bravo platform and its suite of proteomic tools are engineered to bring reproducibility, scalability, protocol portability, and ease-of-use to LC/MS sample preparation. The platform comprises a best-in-class liquid handler, disposable microchromatography cartridges, and simple, user-customizable protocols to enable high-throughput protein digestion and peptide cleanup. Assay developers know that keeping up with constantly changing technology—new software packages, new instrumentation, new search algorithms—takes a great deal of time and energy. If an automation platform requires users to become robotics experts as well as proteomics experts, that means less time and effort are available for developing methods. A good method development platform lets users focus their expertise where it is needed most—on finding a sample prep regime that works for them. Rapid access to essential protocols and system utilities is crucial for helping users transition between workflows, while ensuring optimum system performance is maintained. In traditional automation, procedures are developed and then ported over and locked down in the automation environment. This approach can significantly complicate development, validation, and eventual scale-up of methods to meet throughput demands. In order to truly develop assays in the automation space, users need direct control over such steps as denaturation, alkylation, incubation, and protease addition for an in-solution protein digestion protocol without having to reprogram the automation function to accommodate adding, omitting, or adjusting individual steps. No matter what combination of steps is required, the platform should allow developers to easily and confidently automate their own validated chemistry. Processing thousands of samples per week is of little use if the tasks aren't carried out with sufficient precision to allow quantitative downstream analysis. Load capacity, sample recovery, and fractionation performance all impact LC/MS data quality. Automation can deliver the low intra-day and inter-day variability needed to ensure that your sample prep is as precise as all other analytics in your workflow. Jason D. Russell, Ph.D., is LC/MS scientist at Agilent Technologies. For more on MS, be sure to check out "SISCAPA and Automation for High-Throughput Protein Bioanalysis."